It”s Sam’s birthday tomorrow, June 9. It’s also the first one that Mommy wont be with us to celebrate on this very important event for us. Well, I would like to correct myself. I know Mariel will be with us still, but only in ways that we’ve not had before. For her birthdays, usually it was some creatively- staged children’s theme party that Mariel had tirelessly organized each year (see my most recent post). But the last one was different. As Mariel had suggested that for once we should try to spend it with only the three of us. At the drop of a hat, she had set up a short trip to Singapore for a family outing which had included a fun day at Sentosa resort . We were so tickled with the “scary” cable car ride then and had a nice time too at the entertaining pyro and laser show. I can even recall that it was raining hard when we arrived but simply nothing could have stopped Mariel from booking that one essential “package tour”. And I never saw it coming. For in about a month after we’ve returned from that vacation, Mariel will so suddenly fall ill. 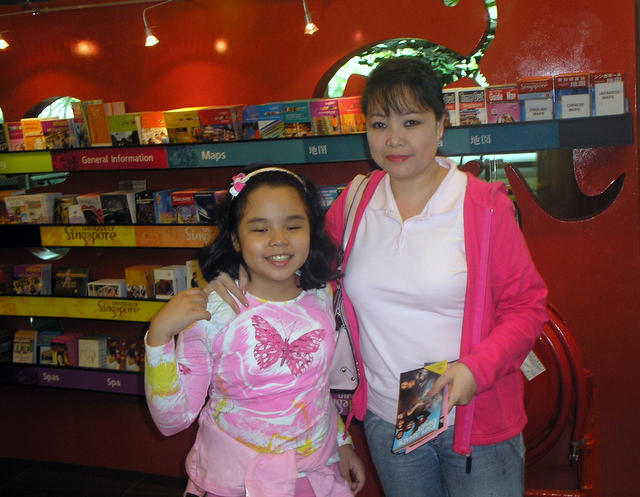 I also remember her to be so unusually insistent that we made this Singapore jaunt. And that she had wanted Sam to fully enjoy her unique birthday treat. Although we’ve made other trips before, this one had, on hindsight, a burning sense of urgency for Mariel. She had even “orchestrated’ a mini-reunion at the Changi Airport with her brother Gerry and sister Joy who was merely passing through Singapore on a connecting flight to South Africa with her family at that time. It was another unusual but very memorable experience. Imagine meeting at the Airport visitor’s lounge at 1230 midnight for some much- needed bonding and coffee (only hours after we just arrived from Manila ourselves). But then maybe Mariel was really just “unconsciously” trying to squeeze in as much time with us as she can muster with an apparently slowly closing agenda. I will never really know for certain. But I am just really glad that she did it it again with her ever- efficient signature style. And that after all, she was just being herself and as predictably she was just again doing the “right things”. If she was with us today, Mariel would have already arranged all the finer details of Sam’s little party tomorrow. She would have sent out the invites much earlier, planned the menu and ordered the cake and cute “loot bags”. Of course now, I have my mom and sister Alma who had so generously pitched in because they know I’m really poor at these things. But I also still miss Mariel’s presence because only she can provide that anticipated “order” in our lives. But we’re not having anything “grand” for tomorrow though. Just your basic poolside get-together for some BBQ and games. And by the way, Sam wouldn’t have anymore of the standard kiddie stuff of yore as she is currently into NBB, Jonas Brothers and Miley Cyrus these days. She even requests a bit of some “rock star” accents to enliven the party if possible. Of course, I’d approve. Because I’m sure Mariel would’ve. And it’s such a tiny gesture to make. And assure Sam that nothing has intrinsically changed with her “connectedness” to her mom. For Mommy just can’t be with us “physically” on the big day. But still all the emotional and spiritual bonds remain strong. For the love Mariel has shared with us persists and endures through eternity. To “Samanting”, Happy Birthday from Mommy, she loves you so very, very much. Belated happy, happy birthday to you. I wish you all the happiness in life. Cherish every moment you have with your Dad. Don’t forget that your Mommy will always be there watching over you. Enjoy and celebrate life — that’s the best gift you can give back to her. Thank you for your kind birthday wishes. I really wish you were with us to celebrate it. I promise also to always do my best to honor and show my love for Mommy. She will forever be my guide and inspiration. Take care and we hope to see you soon.